MTSU’s Stones River Chamber Pl.. Though he considers himself an introvert who grew up in a camping trailer in the middle of the desert behind a garage and experienced a tough upbringing, Civil Air Patrol Maj. Gen. Mark Smith’s extroverted side brought motivation and inspiration to an overflow Middle Tennessee State University classroom. The national commander of the U.S. Air Force auxiliary group spoke of mentorship, servant leadership and “rising from the ashes and learning from failure” Friday (March 22) as he talked to more than 100 students, faculty and staff in the Business and Aerospace Building. 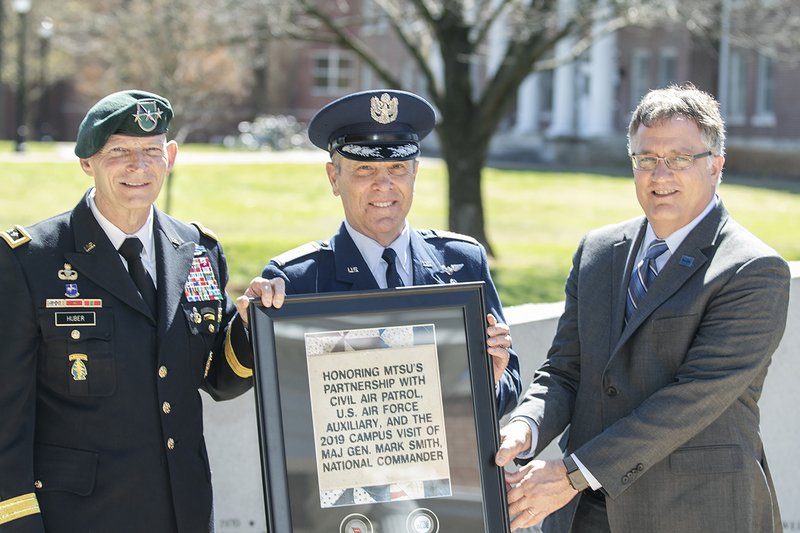 Smith’s lecture, sponsored by the University Honors College and Omicron Delta Kappa leadership honor society, came in front of primarily aerospace students and a group of young CAP cadets. The Civil Air Patrol leader said his low point came May 23, 1993. While up for a promotion to colonel, he was stopped by authorities and charged with drinking and driving. “It was a self-inflicted wound and it was all on me,” he told the captive audience. So he took responsibility and regrouped. The former pilot eventually became colonel and he retired in 2000. Smith was introduced by Casey Brinegar, an MTSU senior with academic ties to both the Honors College and College of Behavioral and Health Sciences. After his talk, she presented him with a framed photograph from ODK and the Honors College. 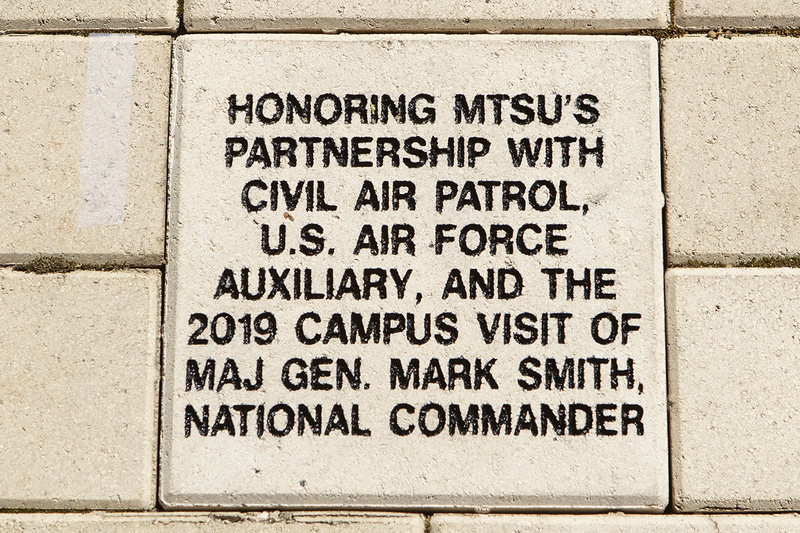 An afternoon recognition ceremony for Smith at the MTSU Veterans Memorial included the placing a brick “Honoring MTSU’s Partnership with Civil Air Patrol, (the) U.S. Air Force Auxiliary and the 2019 Campus Visit of Maj. Gen. Mark Smith, National Commander,” the brick and a commemorative plaque given to him read. “I believe that the existing partnership we have is outstanding, but there’s opportunities for us to grow and expand that partnership in a manner that’s mutually beneficial to both organizations,” he added. 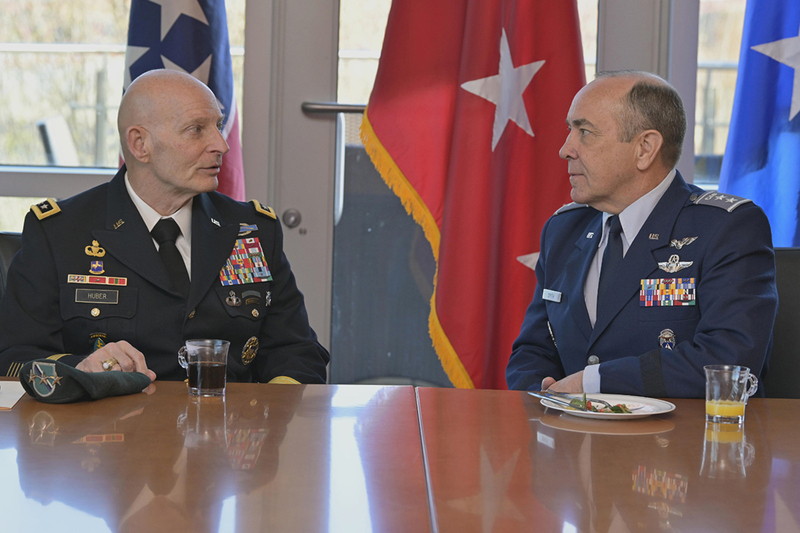 The College of Basic and Applied Sciences and its aerospace department signed a partnership with the CAP’s Tennessee Wing in 2014, providing cadets ages 12 to 18 with opportunities to interact with faculty and explore the Murfreesboro campus. 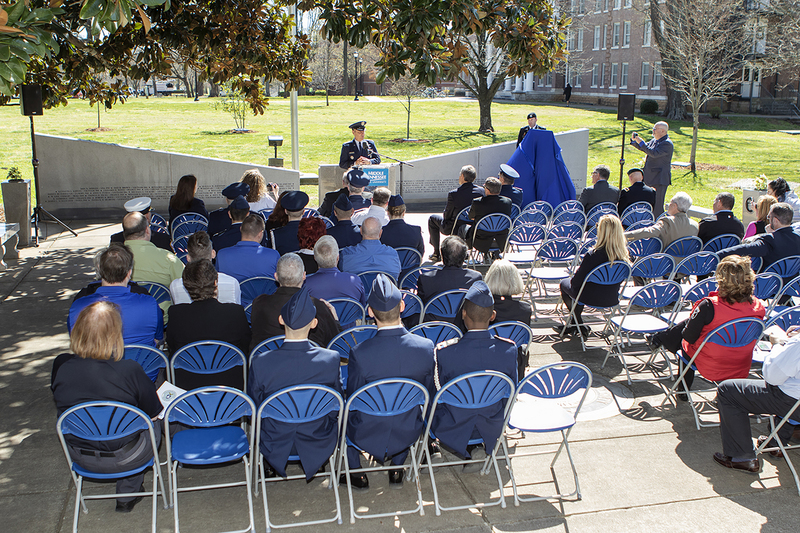 MTSU hosted the Tennessee Wing Cadet Encampment in 2016, 2017 and 2018 and welcomed the 2019 encampment’s leadership cadre to campus earlier this month. The university has also helped lure the Engineering Technology Academy away from Auburn University. MTSU alumnus and Civil Air Patrol Col. Barry Melton, who oversees five states, Puerto Rico and the U.S. Virgin Islands, introduced Smith. MTSU Provost Mark Byrnes provided the welcome. Earlier in the day, Smith and a Civil Air Patrol group with him toured the aerospace department’s air traffic control and other facilities. They saw MTSU’s Flight Operations at Murfreesboro Airport before Smith left to return home. MTSU has more than 300 combined undergraduate and graduate programs. Aerospace is one of 11 College of Basic and Applied Sciences departments.